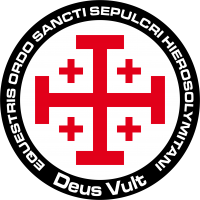 “Deus Vult” (God wants it) Motto of the emblem of the Order of the Holy Sepulchre. The Order of the Knights of the Holy Sepulchre is stationed on Earth and is charged with acting as the last line of defence for the PanOceanian territories and sacred sites. Its members are chosen from the elite of the other Orders’ troops, as all are skilled Father-Officers. The Sepulchrist Knights, lovers of close combat, are units focused on special security and heavy assault, serving as much as an example as a challenge to all other PanOceanian officers. The Knights of the Holy Sepulchre protect Humanity’s birth and sacred places as they are considered the best of the best, and their records confirm it. In the NeoColonial Wars, during the unsuccessful Water Lily Offensive over Hong Kong, the Knights of the Holy Sepulchre’s battalion stood firm until the very end. They were commanded by Abbot-Colonel Acuña and fought like lions, holding their position until the last man from the decimated PanOceanian combat force was evacuated. Then they retreated from the battlefield in perfect combat formation. No officer from the victorious army of Yu Jing dared raise his hand against them as they withdrew. The Sepulchrist Knights left the battlefield as if they had just attended a military parade. Proud, with blue armor covering them from head to toe, and with white robes waving gently in the wind, they boarded their air transport while the Yu Jing army watched with a mixture of admiration, respect and relief.